These skinny banana bread muffins are a lighter take on a muffin. Equally delicious with far less guilt! Muffins. Quite possibly one of the greatest things ever until you realize, crap, I just ate 400 calories and I’m still hungry. And then you look at your skinny jeans. And then you cry. And eat another muffin. 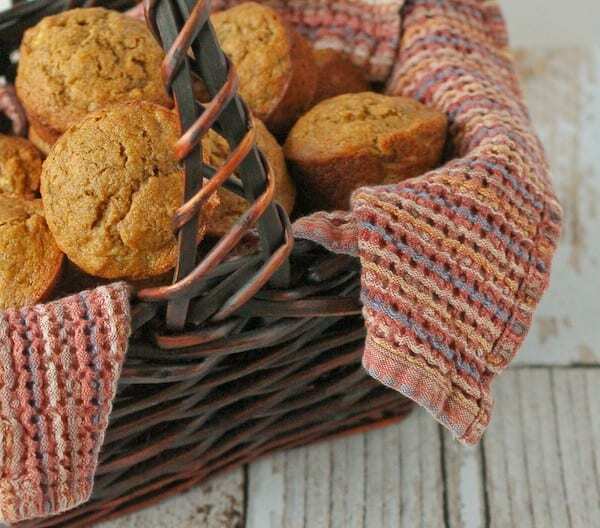 With these tasty treats, you can have your banana bread muffins and eat them too. 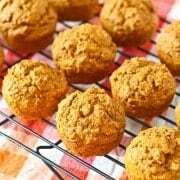 They use 100% whole wheat flour, applesauce with only a bit of oil and an acceptable amount of sugar. I even throw in a bit of ground flax-seed to increase the nutritional benefits. 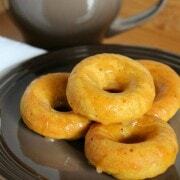 Of course they are still a bit of a treat but are a great breakfast with some fruit or yogurt. They’re a take on my whole wheat banana bread in an easy muffin format. And as a muffin, they’re the perfect grab-and-go breakfast for those extra crazy mornings when you don’t have a minute to even think about sitting down with a bowl of granola or taking the time to make a slice of toast. And isn’t that most mornings? But they’re great for other things too…hmmm….I don’t know? Maybe a Mother’s Day brunch? 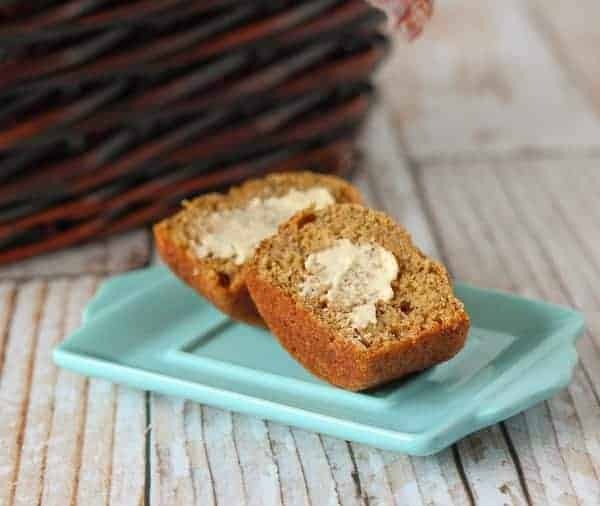 With all the overly decadent foods that are typically part of a brunch, these banana bread muffins will be a welcome healthier addition to the brunch table. They’re also great if you’re not sitting down at a table eating brunch because they are neat(ish) finger food. I don’t know about you, but at most family gatherings we have, we’re not all able to sit around a big table so many of us eat off a plate on our lap. Muffins are perfect for that kind of thing, don’t you think? Hope you love these! 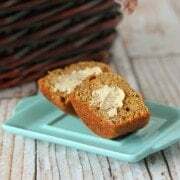 If you’re looking for more skinny bread/muffin recipes make sure to check out my Healthy Apple Bran Muffins, Reduced-Fat Chocolate Banana Bread and Healthier Pumpkin Bread. Heat oven to 350 degrees Fahrenheit. Spray muffin tins with nonstick cooking spray. In a medium bowl, whisk together flour, baking soda, baking powder and salt. In another bowl, whisk together sugar, applesauce, oil, and vanilla extract. Whisk in eggs until combined. Using a large spoon, stir in banana. Gradually stir in flour mixture until just combined. Evenly pour batter into prepared muffin tins. Bake until a toothpick inserted in center of a muffin comes out clean and muffins are golden brown, about 18 minutes. Transfer muffin tins to a wire rack and let cool 5 minutes. Remove muffins from tin and let stand until cooled completely, or better yet, enjoy warm. I made these the other day I love them. The whole family enjoys these. They are very moist muffin and the flavor is out of this world! Does anyone know how many Weight Watcher points these could be? I just made these muffins last night and the are delicious! Thank you for the recipe. I will definitely make them again. Loved these muffins! 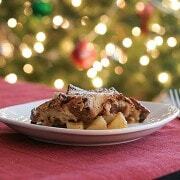 I have shared the recipe with the ladies at our church and everyone loves them! Thanks for such a delicious recipe! I hear ya on the skinny and the blogging and eating muffins. It is a rotten cycle but someone’s got to do it. I guess that just means more time at the gym so I can keep eating those muffins. I love that you skinnified these muffins! It means I can have more, right? I’m with you- I want to be fit, healthy, etc…. and skinny. Can’t help it:-) I’m all for a skinny muffin! 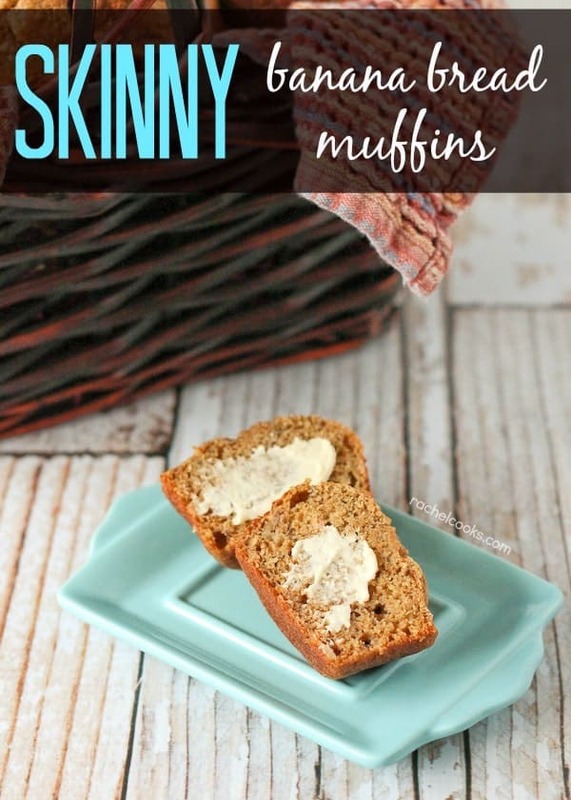 Love banana bread, and these skinny banana bread muffins look sooo yummy!! I suspect that your post echoes every food lover out there. And you KNOW that all your readers are food lovers. I can’t believe how many calories a regular muffin can have. It’s so easy to say, oh I just had a muffin—like it was ho hum nothing. I am not even going to go to the topic of skinny jeans. Like they say, its better to focus on a solution than the problem. I think you are presenting a solution. Gold Stars for you! hahhah I want to be skinny too darnit! Love these…banana bread is practically a food group in our house! I was worried when I saw the word skinny it would have artificial sweeteners. This looks yummy. and real! Muffins are one of my favorite things to bake, and I also try to make them healthy so I don’t feel guilty about having them for breakfast or a snack. Plus, they freeze so well. I usually pop one in my lunchbox the night before, and then it’s defrosted and ready for me at work the next morning. These Skinny Banana Bread Muffins look like the perfect way to treat yourself and still feel good about it later! I’m right there with you on the skinny….and the muffins. Pinned. I love the idea of these! I don’t make banana bread enough and now I want it in the form of muffins! !